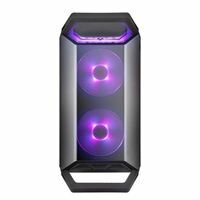 The MasterBox Q300P is your portable option in the lineup of the brand new MasterBox Q-series from Cooler Master. A series that might be small in size but excels in functionality and modularity without compromising on the thermal performance. Four removable handles and the DarkMirror front and top panels makes the chassis easy to transport and stands out from the rest. Although the size wouldnt tell, the MasterBox Q300P supports a standard ATX PSU which we dont see often in the market with this size. Due to the cube design of the frame you can turn and rotate this chassis in multiple positions. The I/O panel can be adjusted to six different locations, three options at each side of the case. Two RGB fans are pre-installed in the front of the case. You can decide which setup and color theme fits you best. The combination of the portable design and the unique exchangeable outlook makes the MasterBox Q300P the perfect choice for gamers and creative builders.